The "Foxfire" books began as a student-produced magazine in 1966 that contains stories and interviews from elders in their rural Southern Appalachian community. The books are anthology collections of material from The Foxfire Magazine, edited and published by Eliot Wigginton. 1972-04-03. New. Ships with Tracking Number! INTERNATIONAL WORLDWIDE Shipping available. Buy with confidence, excellent customer service! Garden City, New York: Doubleday & Company, Inc, 1972. 2nd Printing. 384pp. hardcover in VG condition. Author signed and inscribed to H. and K. Sanborn, April 4/31/72. Pages crisp with 294 b/w photo. Author documents various aspects of mountain living. plates. Second printing. DJ missing. Some soiling to textblock. Boards: Tan cloth covered, minimal mildew stain, warped slightly, with dampstain along spine edge, and spine sunned with brown lettering. Shelve American regional history. Shelved Dupont Bookstore. Hardcover. 384 pp. Anchor / Doubleday, New York (1972). First Edition. Seventh Printing per Number Line. Bright, square, clean, unmarked copy appears mostly unread. Straight and square cloth boards and corners. Lightly softened spine ends. Price-clipped DJ has light chipping at spine ends. F/NF. More photos on request. Shipped in a box within a box, in bubble wrap, with a tracking number. Anchor Books, 1972. 11th printing Inscription reads For chip with thanks for Your Interest, Elliot Wigginton Oct 29 1976. Inscribed By the Author. 11th Printing. Hardback. Fine/Vg. Hardcover in Slipcase. Turtleback Books. SCHOOL & LIBRARY BINDING. 0613186699 New Condition. . New. Turtleback Books. SCHOOL & LIBRARY BINDING. 0613186699 Like New Condition. . Fine. Softcover. 384 pp. Anchor Books/ Doubleday, New York (1972). First Edition. 14th Printing stated. "Anchor Books Edition: 1972" on Copyright Page. AO-36 code and $3.95 original price on Front Cover. No ISBN present. Minor sunning and slightest edgewear to covers. No markings inside or out except old price marking on front card. Minor soiling to covers and reading creases to spine. Very Good+ to Near Fine condition. More photos upon request. Shipped in a box within a box, in bubble wrap, with a tracking number. 1972-04-03. Good. Ships with Tracking Number! INTERNATIONAL WORLDWIDE Shipping available. May not contain Access Codes or Supplements. May be ex-library. Shipping & Handling by region. Buy with confidence, excellent customer service! Doubleday, 1972-01-01. Hardcover. Good. 9.4000 inches 5.7000 inches. Dust jacket shows some wear. Former owner's name on front page. Pages are clean and intact. Doubleday, 1972-02-17. Hardcover. Very Good. Nice looking book, has minor edge wear. Pages are not crisp white. Turtleback Books. SCHOOL & LIBRARY BINDING. 0613186699 . New. Turtleback Books. SCHOOL & LIBRARY BINDING. 0613186699 Minor shelf wear . Very Good. Turtleback Books. SCHOOL & LIBRARY BINDING. 0613186699 signs of little wear on the cover. . Very Good. NY: Doubleday, 1972. The dustjacket shows some edgewear with several tears and tape repair.. Hard Cover. Very Good/Good. Anchor, 1972-02-17. Paperback. Used:Good. In Stock. Always but with confidence. Anchor, 1972. Paperback. Very Good. excellent overall, light reader wear, mostly to cover. Top right corner of cover torn away, probably to remove former owners name. San Val, 1972-02-01. School & Library Binding. Used:Good. Garden City, NY: Doubleday & Company, Inc, 1972. Book Club. Hardcover. Near Fine/very good. Book Club Edition. c.1972. Hardcover. Cloth. 8vo. 384pp. Near Fine in Very Good dustjacket. Mild general wear. Rubbing to dustjacket, light wear at corners and spine-ends. Anchor, 1972-02-17. Paperback. Very Good. Nice looking book, has minor edge wear..
Anchor, 1972-02-17. Paperback. Good. Nice looking book, has minor edge wear.has light scratches on front cover & spine. Anchor, 1972-02-17. Paperback. Very Good. Nice looking book, has minor edge wear. Anchor, 1972-02-17. Paperback. Very Good. Nice looking book, has minor edge wear.cover is faded. Anchor Books, 1972-01-01. Paperback. Good. Nice looking book, has minor edge wear.light coffe cup stain on front & rear covers. New York, New York, U.S.A.: Doubleday, 1972. Some foxing present, book is askew due to improper storage on bookshelf.. Later Printing. Hard Cover. Good/Good. Anchor Books. Very Good- with no dust jacket. 1972. Eighteenth Printing. Softcover. 0385073534 . Front cover price clipped. ; 9.25" tall; 384 pages . Garen City, New York: Anchor Books/Doubleday, 1972. 1972, 1973. Paperback formats. 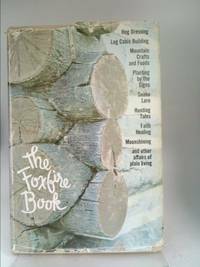 SET OF TWO BOOKS: The Foxfire Book (1972), 384 pages: Hog dressing, log cabin building, mountain crafts and foods, planting by the signs, snake lore, hunting tales, faith healing, moonshining, and other affairs of plain living. Foxfire 2 (1973), 410 pages: Ghost stories, spring wild plant foods, spinning and weaving, midwifing, burial customs, corn shuckin's, wagon making, and more affairs of plain living. Condition: The Foxfire Book has darken spine, some abrasion/creases to binding, light age toning. Eight pages detached, but laid it (typical of this type of binding for a thick book). Overall Very Good. Foxfire 2: Minor wear to binding, light age toning, else overall Near Fine. Both books: Free of stickers, bookplates, writing in text, and page tears. Not former library books. These how-to books help and guide people to living the plain life, especially in the mountains. The books tell how to build things, including a log cabin, baskets, and beds. They tell how to make soap; churn your own butter; slaughter hogs; cook; make a tub wheel, a foot-powered lathe, an ox yoke; raise sheep; conduct old-time burials; wash clothes in an iron pot, and much more. Practical advice, great insights, and simple ways of living the plain life. Note: We are a well-established, well-respected, ethical book dealer in business since 1991. We describe the condition of our books thoroughly and honestly, so you'll know exactly what you will be receiving when you order. We ship promptly. . Paperback. Very Good. New York, New York, U.S.A.: Anchor Press/Doubleday, 1972. First Edition Later Printing 5th or later Printing. Soft cover. Very Good. The first in the series of Foxfire books from the first wave of the environmental movement in the 1970s, aimed at fostering sustainable living in harmony with nature. 384 pages, including Index. Original 1972 edition, 8th printing. Oversized, thick softcover book has light brown covers with darker brown lettering. Condition is VG: extremely clean, binding tight & square, NO writing/underlining/highlighting; NOT ex-lib. Flaws: heavy tanning/discoloration to spine, very light edgewear all around. Please see our 5 photos--they show the EXACT book you will receive from us, never "stock" images! Photos & description copyright Gargoyle Books 2018. All orders before 2 pm Weekdays ship that same day--weekends & holidays ship very next business day. Garden City: Anchor Books, 1972. Paperback. 8vo. Stiff wrappers. 384pp. Numerous illustrations. Very good. Mild wear and age toning to outer wrappers. Umpteenth later (18th!) printing of this classic, tight and nice. Garden City: Doubleday & Company, 1972. Paperback. Small 4to. Stiff wrappers. 384pp. Numerous illustrations. Very good. Later (4th) printing of this classic, tight and nice. From the private library of noted social protest poet and fine press publisher JOHN BEECHER (1904-80). Turtleback Books, 1972. Paperback. Good. Disclaimer:A copy that has been read, but remains in clean condition. All pages are intact, and the cover is intact. The spine may show signs of wear. Pages can include limited notes and highlighting, and the copy can include previous owner inscriptions. An ex-library book and may have standard library stamps and/or stickers. At ThriftBooks, our motto is: Read More, Spend Less.Dust jacket quality is not guaranteed. Anchor Books, 1972. Book. Good. Soft cover. Condition: Very Good. Light shelfwear and handling to cover. Interior clean, except gift marking on first front end pg. No highlights. No remainder marks. Solid binding. No rips or tears to cover. No creases to spine. No clipping. No dogeared pages. No book plates. Not an ex libr. B/w illustrations and photographs. Softcover. Mountain Craft, foods, and plain living. Hog dressing, log cabin building, mountain crafts and foods, planting by the signs, snake lore, hunting tales, faith healing, moonshining, and other affairs of plain living. Anthropology of American know-how. Language: English, ISBN-10: 0385073534, ISBN-13: 9780385073530, Publisher: Anchor, Format: Paperback, Publication Date: Mar 1972..
New York: Anchor Press/Doubleday CR 1972, dust jacket has tears, otherwise good+ condition, 384 pages with index of people. Profusely illustrated. Hog dressing, log cabin building, mountain crafts and food, planting by the signs, snake lore, hunting tales, faith healing and moonshining.. Eleventh Printing. Hard Cover. Doubleday Religious Publishing Group, The, 1972. Hardcover. Good. Disclaimer:A copy that has been read, but remains in clean condition. All pages are intact, and the cover is intact. The spine may show signs of wear. Pages can include limited notes and highlighting, and the copy can include previous owner inscriptions. At ThriftBooks, our motto is: Read More, Spend Less.Dust jacket in acceptable condition. Shelf and handling wear to cover and binding, with general signs of previous use. Secure packaging for safe delivery.Dust jacket quality is not guaranteed. Doubleday Religious Publishing Group, The, 1972. Hardcover. Good. Disclaimer:A copy that has been read, but remains in clean condition. All pages are intact, and the cover is intact. The spine may show signs of wear. Pages can include limited notes and highlighting, and the copy can include previous owner inscriptions. At ThriftBooks, our motto is: Read More, Spend Less.Dust jacket quality is not guaranteed. Doubleday Religious Publishing Group, The, 1972. Hardcover. Acceptable. Disclaimer:A readable copy. All pages are intact, and the cover is intact. Pages can include considerable notes-in pen or highlighter-but the notes cannot obscure the text. The dust jacket is missing. At ThriftBooks, our motto is: Read More, Spend Less. Anchor, 1972-02-17. Later printing. Paperback. Used:Good. Doubleday. VG/No Jacket. 1972. First Edition 14th Printing. Trade Paperback. 0385073534 AO-36. Wraps scuffed and soiled; reading creases; corner creases; 384 pages; gift inscription inside ((37)) WE HAVE OTHER COPIES OF THIS TITLE. .
New York, NY, U.S.A.: Anchor Press/Doubleday, 1972. Large, sturdy softcover, heavier light brown wrappers, spine lightly browned, 384 lightly browned pages, many photos and illustrations throughout. First in series by children recording crafts, work and lore of Appachin mountain folk. Very slight surface wear to top front tip and long front edge, slight surface wear to spine and top back right. Near Good.. Soft Cover. Good. Anchor Books. PAPERBACK. B010TUAOU6 Clean, has a good binding, no marks or notations. Mild cover wear. . Good. U.S.A.: Anchor, 1972. Book. Very Good. Soft cover. Very Good vintage softcover. Interior is pristine tight crisp clean like new unread, other than aging. Exterior has sunned and stained covers, closed tear front cover and some light creasing and soiling overall..